HH addressing a rally in Eastern province. 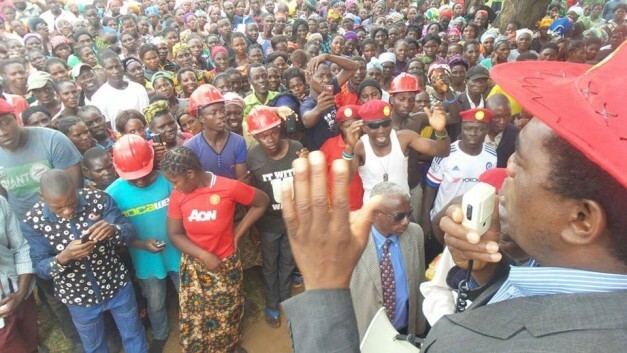 The other day, UPND leader Hakainde Hichilema (HH) made triumphant entry into Kumawa – Eastern province! He was proudly flanked by his two able deputies; son of the soil and illustrious medical practitioner Canicious Banda on one hand, and the man renowned for inflicting so much pain on the ruling party for bull-dozing his way into their stronghold and firmly planting UPND there, self-made multi-millionaire businessman, Geoffrey Bwalya Mwamba otherwise better known as GBM, on the other. And indeed UPND can now boast of a Councilor in Northern Province! Children abandoned whatever they were doing and trotted after the motorcade, women shrieked excitedly and ululated joyously while the youths stripped-off their shirts in a typical Ngoni warrior way and ran alongside the procession as it made its way into the city. And the men nodded their heads in approval, and vigorously waved the UPND symbol. While this may spell a bad omen for the ruling party PF, it is definitely a harbinger of better things to come for opposition UPND. Eastern province is President Edgar Lungu’s home province; naturally, one would expect Lungu to command unassailable support in the area. If late President Michael Sata for example, never commanded unparalleled support in the area where he hailed from, he wouldn’t even have imagined himself romping home to victory in the September 2011 polls. If the manner UPND leader HH has excited the crowds and captured people’s imaginations in Eastern province is anything to go by, a panic button has definitely been set in motion within PF circles! The chief economic stay of Eastern province is obviously agriculture. This is the area known for producing quality chalimbana groundnuts, cotton, maize and tobacco among other things. What message is therefore likely to gel well with the Easterners? Obviously, electorates want to connect with a party that is going to assure them of early delivery of farm inputs, accord them affordable agriculture inputs and of course facilitate easy access to the market. This is the kind of message which is going to mellow-down people’s hearts and make their faces glow with glee in return! This is exactly the same gospel that UPND has been preaching to easterners over and again, and it seems to be finally paying dividends. If we are to take the current political landscape into perspective, we can safely conclude that UPND already has Central, Western, North western and Southern provinces under its belt while PF may claim to maintain some semblance of foothold in their traditional strongholds of Luapula, Northern, Muchinga, Copperbelt and Lusaka provinces. However, this may no longer be the case. Of course there are several factors pointing to this. Firstly, the massive job losses in urban provinces, particularly on the Copperbelt, have definitely alienated a significant chunk of voters from the ruling party. About 8000 miners and contractors lost their jobs in the mines due to the structuring exercise. Add their immediate and extended families to this figure; this translates into thousands of votes. Secondly, the Miles Sampa factor has tremendously eroded the PF support base in Northern, Muchinga and Luapula provinces. Lungu must be ruing the day he crossed swords with the evergreen Member of Parliament from Matero who has since gone on to launch his own political party. When he resigned as deputy minister, the astute and shrewd politician that Sampa is proving to be by the day; “tricked” the leadership that he wanted to concentrate on helping reorganize the party around the country. As soon as they got hypnotized and fell sound asleep, the man from Matero got down to work converting PF members into his disciples! Just wait for parliament to be dissolved and you’ll see what will be left of PF. This leaves us with one province – Kumawa! Of course the wise people from the east have already decided what they want. This one will definitely be quite an interesting election indeed. As they say in Nyanja, “wina azalila!” Someone will definitely cry come August 11, 2016, let’s wait and see. Can we entrust HH with the Presidency? Edgar Lungu has no message there apart from saying i’m your child because I come from here, vote for me. Unfortunately this does not put food on people’s tables neither does it remove poverty. There is equally no road infrastructure built in Eastern Province for him to point at for during campaigns even though this alone does not bring food on anybody’s table. In short ECL is confused as to the message to give the Easterners and all Zambians in general. He will not be re-elected because now we have seen his incompetency.He is a mistake President who is lost in the jungle of self made problems. Only some town based selfish and tribalists who have no work/business in cities will be talking about wako ni wako since they survive on scavenging in the garbage pits. Don’t understand the importance of electing top quality and visionary leadership. All they know is to keep their tribally allocated jobs and their fear that another person will do likewise and chuck them out of those jobs for their incompetency. Yes,Everywhere you go in southern province its still about HH! Imagine if PF cadres had also come out showing of their muscles too! It would have been kafwafwa! Easterners are humble and polite people try the same stuff in Luapula, Muchinga or nothern province. Such show off is not necessary if we have to check violence in Zambia mwe bantu! Who has stopped PF from doing that? Is it not because where ever they try to meet people, there meetings are poorly attended and so they fear to publicize the pictures. Just accept its HH’s time my friend. Ba Zakeyo ubukopo. Can’t you see that in many parts of Zambia people are saying let us just try this HH. i can’t blame you for such dullness. Eastern Province is not Chipata, it is very big. It has a number of districts and rural/remote areas. Do not be cheated. Chipata town is like Livingstone where anyone can have a show. But of course, it is wishful thinking that HH can win even 20% of the vote there. Tell me, who can vote for PF now? For what? just because they belt a bridge or a road or even a school while failing to put food on peoples table? Continue living in denial. This is time to be serious about choosing credible leaders not based on tribe because tribe will not put food on the table or even make your life easy. Zambians have only one chance and if messed up let them be ready to bear the consequences for another years. @Chaona, in politics you can measure your party attractiveness by the people attending your reallies. Those people who welcomed upnd in chipata come from villages elsewhere in rural eastern province, where ever they will go they ar compaining materias, it is like door to door spreading the message of their disatification of pf government and influencing change.of rulership on others.. 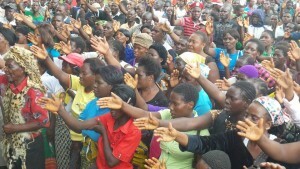 Yes the people that attend the rallies some are just listeners, but those that run along when welcoming those are the most important people, they run with the euphoria and a lot of energy and you can see real support thats what we have been seeing , look at Kasama and Chipata itself , copper belt towns. The other thing logically PF has broken three times , Sampa has a group from pf, Kabimba has a group from pf and the owners who have remained , then you have those who will leave after the adoption process has finished,then you have those who are quite in Lusaka central who belong to Guy Scot dont undermine him he is founder member and vice president he has a following in Lusaka. The mistake PF have made, some of them UNZA CBU issue,cheating about load shedding, locking up Mwamba on flimsy ground careless talk by Kambwili Cheating marketeers of empowerment fund the miners All these factors are working against pf including the grade 12 issue , which we have seen ministers resigning in the recent past, the deputy ministers are have a following they will also leave in frustration. Wina azalila. Lol! The falling one will definitely cry after falling. A multitude of people attending a political rally is not an assurance that UPND has taken over Eastern Province. Because anyone can attend the the so called political rally. Don’t cheat yourselves. Marking a cross on the ballot paper is a secret, always remember this. Edgar is not from eastern, he was born on the copperbelt and has spent most of his adult life in lusaka, only his surname hails from the east not him, he even has no idea what the people in eastern province do for a living, and this time around i doubt if easterners would like to be associated with old adage of that stubborn fly that always goes to the grave with the corpse, they held on to unip, mmd up to the grave,now pf no ways, they ain’t going down with pf. ROCK Zambia HH,GBM CB NALUMAN WE WANT YOU AND UPND ON 11.08.16 not the tribalist load shedding paya farmers. only god can save pipo from this problems we are facing. Tribal allegations have failed and now is violence. Waste time on these while hh is moving. Pf has nothing to tell us. No lomger sata’s vision. We have seen for ourselves that pf does not deserve any more sympathy vote. Ecl means no vision leader, corrupt, incompetent must never be allowed farming, education,youths employment and businesses in zambia all these have callapsed due to one useless pf thug leader. Dont talk about Tonga party this time around this is similar to 1991, let parliament dissolve.